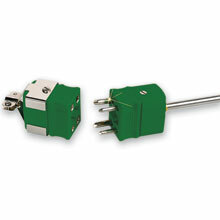 OMEGA™ dual-element thermocouple assemblies are manufactured using 4-conductor OMEGACLAD™ wire, and feature rugged DTC connector terminations. SS, Inconel® and Super OMEGACLAD™ XL sheaths are available in sizes from 1.5 to 6.0 mm O.D., with either grounded, insulated, or exposed junctions. Mating connector is included. Standard length is 300 mm, with other lengths available. Examples of Pricing for Popular Models are Referenced in the "To Order" box. Use the "Part Number Builder" below to get pricing for all available models. Super OMEGACLAD™ XL highlighted in yellow and is available with Types K and N only. Nota: To order with Super OMEGACLAD™ XL sheath, change "SS" in model no. to "XL"
PFA Coating is available, 205°C Max.